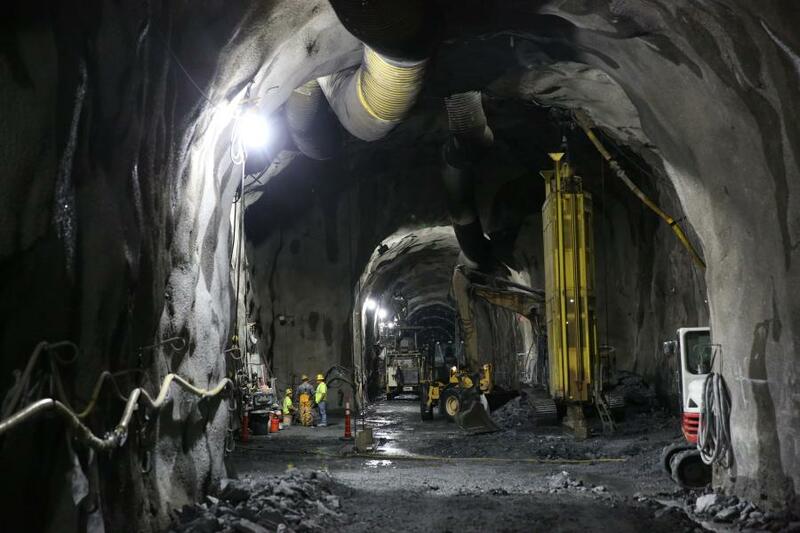 The New York City Department of Environmental Protection (DEP) announced that tunneling for the Delaware Aqueduct Bypass Tunnel reached the halfway point as workers 600 ft. underground continued to drive eastward toward the Hudson River. The milestone underscores significant progress on the city's $1 billion effort to repair two leaks in the Delaware Aqueduct. The project is the largest repair in the 176-year history of New York City's water supply system. "DEP and local laborers have made great progress on the Delaware Aqueduct Bypass Tunnel," DEP Commissioner Vincent Sapienza said. "As we mark the halfway point of tunneling, we are happy to see that the project is on schedule and moving steadily toward completion in 2023. This massive repair effort is critical for the long-term reliability of the water supply system that sustains 9.6 million New Yorkers every day." The centerpiece of the repair is a 2.5-mi.-long bypass tunnel that DEP is building 600 ft. under the Hudson River from Newburgh to Wappinger. When it is finished in 2023, the bypass tunnel will be connected to structurally sound portions of the existing Delaware Aqueduct on either side of the Hudson River to convey water around a leaking section of the tunnel. The 85-mi.-long Delaware Aqueduct, the longest tunnel in the world, typically conveys about half of New York City's drinking water each day from reservoirs in the Catskills. The massive tunnel boring machine that is excavating the new bypass tunnel reached the halfway point on Tuesday. The boring machine is now located less than one-half mile from the western edge of the Hudson River, hundreds of feet below the surface in the town of Newburgh. The tunnel boring machine has mined approximately 6,200 ft. of the bypass tunnel thus far. According to data tracked by DEP, the machine excavated 85 linear ft. on its most productive day, 319.9 ft. during its best week, and 939.8 ft. during its most productive month. DEP began mining the tunnel in December 2017. Workers are currently on schedule to finish tunneling next winter. As the tunnel boring machine pushes forward, it also lines the shale and limestone bedrock with precast rings of concrete. A total of 1,238 concrete rings were installed by the machine as of Dec. 4. Once mining is finished, the tunnel also will be lined with steel and a second layer of concrete. This "triple-pass" design will provide the bypass tunnel with structural stability and prevent leaks from occurring again in the future. DEP has monitored two leaking sections of the Delaware Aqueduct — one in the Orange County town of Newburgh, and the other in the Ulster County town of Wawarsing — since the 1990s. The leaks release an estimated 20 million gal. per day, about 95 percent of that escaping the tunnel through the leak near the Hudson River in Newburgh. DEP has continuously tested and monitored the leaks since 1992. The size of the cracks in the aqueduct and the rate of leakage have remained constant over that time. In 2010, the city announced a plan to repair the aqueduct by building the bypass tunnel around the leaking section in Newburgh, and also by grouting closed the smaller leaks in Wawarsing. The project began with the excavation of two vertical shafts in Newburgh and Wappinger to gain access to the subsurface. These shafts, 845 and 675 ft. deep respectively, were completed in 2017. Workers then built a large underground chamber at the bottom of the Newburgh shaft. That chamber has served as the staging area for assembly and operation of the tunnel boring machine, and as the location from which excavated rock is brought to the surface by a large crane. The existing Delaware Aqueduct will stay in service while the bypass tunnel is under construction. Once the bypass tunnel is nearly complete and water supply augmentation and conservation measures are in place, the existing tunnel will be taken out of service and excavation will begin to connect the bypass tunnel to structurally sound portions of the existing aqueduct. While the Delaware Aqueduct is shut down, work crews also will enter the aqueduct in Wawarsing to seal the small leaks there, roughly 35 mi. northwest of the bypass tunnel. The project will mark the first time that the Delaware Aqueduct will be drained since 1958. In 2013, DEP installed new pumps inside a shaft at the lowest point of the Delaware Aqueduct to dewater the existing tunnel before it is connected to the new bypass tunnel. 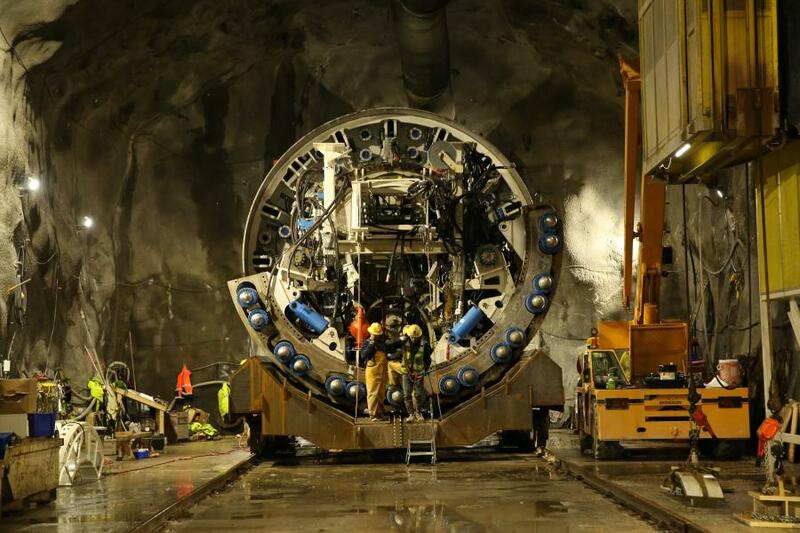 Those pumps will be tested several times before the tunnel is drained in 2022. The nine pumps are capable of removing a maximum of 80 million gal. of water a day from the tunnel — more than quadruple the capacity of the pumps they replaced from the 1940s. The largest of the pumps are three vertical turbine pumps that each measure 23 ft. tall and weigh 9 tons. The Delaware Aqueduct Bypass Tunnel is being excavated by one of the world's most advanced tunnel boring machines (TBM). The machine — which measures more than 470 ft. long and weighs upwards of 2.7 million lbs. — was named in honor of Nora Stanton Blatch Deforest Barney, a noted suffragist and the first woman in the United States to earn a college degree in civil engineering. Nora, who worked for the city as a draftsperson during the construction of Ashokan Reservoir, was also the first female member of the American Society of Civil Engineers. The $30 million TBM arrived at the worksite in Newburgh in 2017. It was delivered in 22 pieces and took four months to assemble. The 21.6-ft. diameter TBM was built to withstand more than 30 bar of pressure — believed to be the most of any TBM ever manufactured — that's about 11 times the amount of pressure from a garden hose. The machine needs to withstand high pressure because workers encountered huge inflows of water under immense pressure when the aqueduct was first built more than 70 years ago. The TBM also is equipped with dewatering equipment to pump 2,500 gal. per minute away from the tunnel as the machine pushes forward. In addition, the machine is outfitted with equipment to install and grout the concrete lining of the tunnel, and to convey pulverized rock to a system of railroad cars that follows the TBM as it works. The railroad cars regularly travel back and forth between the TBM and the bottom of Shaft 5B in Newburgh, delivering workers, equipment and rock between the two locations. Workers have been excavating the tunnel 24 hours, six days a week. DEP manages New York City's water supply, providing more than 1 billion gal. of high-quality water each day to more than 9.6 million New Yorkers. This includes more than 70 upstate communities and institutions in Ulster, Orange, Putnam and Westchester counties who consume an average of 110 million total gal. of drinking water daily from New York City's water supply system. This water comes from the Catskill, Delaware, and Croton watersheds that extend more than 125 mi. from the city, and the system comprises 19 reservoirs, three controlled lakes and numerous tunnels and aqueducts. DEP has nearly 6,000 employees, including almost 1,000 scientists, engineers, surveyors, watershed maintainers and other professionals in the watershed. In addition to its $70 million payroll and $168.9 million in annual taxes paid in upstate counties, DEP has committed more than $2.7 billion in watershed protection programs — including partnership organizations such as the Catskill Watershed Corporation and the Watershed Agricultural Council — that support sustainable farming practices, environmentally sensitive economic development, and local economic opportunity. In addition, DEP has a robust capital program with $19.1 billion in investments planned over the next decade that will create up to 3,000 construction-related jobs per year.